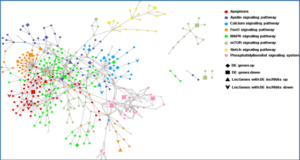 Researchers at the Peking University School of Basic Medical Sciences set out to assess the global changes in and characteristics of the transcriptome of long noncoding RNAs (LncRNAs) in heart tissue, whole blood and plasma during heart failure (HF) and association with expression of paired coding genes. 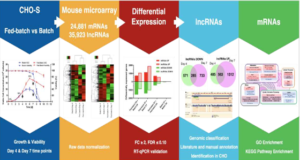 The researchers used microarray assay to examine the transcriptome of LncRNAs deregulated in the heart, whole blood, and plasma during HF in mice. They confirmed the changes in LncRNAs by quantitative PCR. 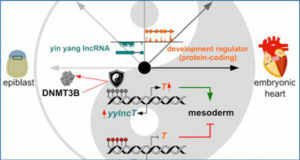 They revealed and confirmed a number of LncRNAs that were deregulated during HF, which suggests a potential role of LncRNAs in HF. 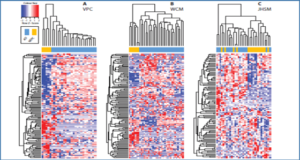 Strikingly, the patterns of expression of LncRNA differed between plasma and other tissue during HF. LncRNA expression was associated with LncRNA length in all samples but not in plasma during HF, which suggests that the global association of LncRNA expression and LncRNA length in plasma could be biomarkers for HF. In total, 32 LncRNAs all expressed in the heart, whole blood and plasma showed changed expression with HF, so they may be biomarkers in HF. 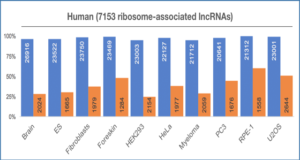 In addition, sense-overlapped LncRNAs tended to show consistent expression with their paired coding genes, whereas antisense-overlapped LncRNAs tended to show the opposite expression in plasma; so different types of LncRNAs may have different characteristics in HF. 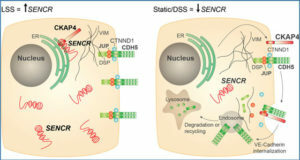 Interestingly, the researchers revealed an inverse correlation between changes in expression of LncRNAs in plasma and in heart, so circulating levels of LncRNAs may not represent just passive leakage from the HF heart but also active regulation or release of circulatory cells or other cells during HF.